On Friday January 18, 2013, Judge James E. Boasberg of the United States District Court for the District of Columbia struck down the IRS’s Registered Tax Return Preparers (RTRP) program and enjoined the IRS from enforcing the regulations. • Boasberg ruled against the IRS and in favor of the unenrolled tax preparers. 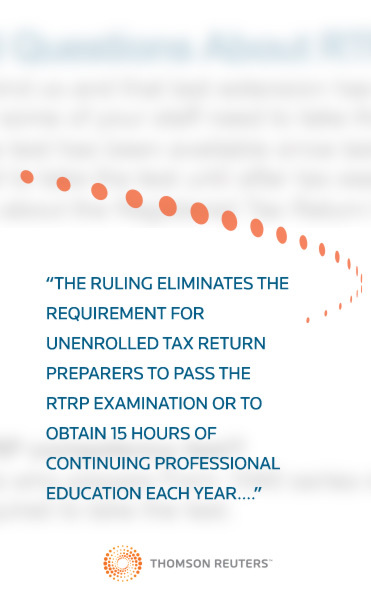 The ruling eliminates the requirement for unenrolled tax return preparers to pass the RTRP examination or to obtain 15 hours of continuing professional education each year in order to prepare income tax returns for pay. • The ruling also granted permanent injunctive relief, enjoining the IRS from enforcing its regulation scheme against unenrolled tax preparers. • Abandon any further attempts to regulate unenrolled tax preparers. • Appeal the judge’s ruling. • Seek congressional statutory authority to regulate RTRPs. • Go about business as usual with no need to pass the RTRP exam or obtain the required continuing education. • Continue to comply with the RTRP regulations voluntarily. • Become an Enrolled Agent. The court ruling striking down the RTRP regulations does not have any effect on the IRS’s Preparer Tax Identification Number (PTIN) requirements. All paid tax return preparers will still have to obtain their PTIN each year. If you plan to, or have already become an RTRP, I would recommend that you voluntarily take the 15 hours of continuing education each year. If the IRS does obtain the authority to regulate unenrolled tax preparers (which I believe is the likely outcome), you will be ready and up-to-date on the latest tax laws. Here at Thomson Reuters, we have created courses, webinars, and a subscription package designed specifically to meet RTRP regulations. Regardless of the outcome of this ruling, we are happy to have developed products that are customized specifically for tax return preparers who need clear and succinct update training to meet the needs of their clients each tax season. I think the IRS will probably seek congressional statutory authority to regulate RTRPs; however, with Congress’s lack of ability to pass any meaningful legislation it may take a very long time. What do you think? THE AMERICAN TAXPAYER RELIEF ACT OF 2012 --SO WHERE’S THE RELIEF? I don’t see how they can call a piece of legislation, “The American Tax Relief Act of 2012” (ATRA) when the Act did not extend the 2% payroll tax reduction allowing the rate to increase back to its previous level of 6.2% of wages. By not sustaining the reduced rate they have in fact increased the taxes of every working American by 2%. • Increased rebate amounts to Puerto Rico and the Virgin Islands of a tax on rum imported into the US. Estimated costs $222 million. • Quicker write off of improvements by motorsport race tracks (NASCAR). Estimate costs $78 million. • Tax breaks for TV and movie producers that allow them to more quickly write off expenses. Estimated costs $248 million. • Tax credits of up to $2,500 for purchasing electric powered motorcycles. Estimated costs $7 million. Probably one of the better things included in the legislation was to make permanent the Alternative Minimum Tax (AMT) threshold and indexing it to inflation. The new threshold amount is $78,750 and $50,600 for married and single respectively. The current maximum tax rate of 15% on net capital gains was extended permanently at 15% except for individuals earning $450K for married filing jointly and $400K for aingle filers. For these individual the rate increases to 20%. The tax exemption for the estate, gift, and generation-skipping tax was permanently extended at $5 million per person and indexed to inflation; however, the top rate was increased to 40%. Current individual income tax rates (10% - 35%) were permanently extended, except for those individuals making $400K or more and married joint filers making $450K or more. For these taxpayers the top tax rate is increased to 39.6% . The personal exemption phase-out and the itemized deductions phase-out were repealed by the Act except for taxpayers with adjusted gross income of $300K for married filing jointly, $275K for head of household, and $250K for single. 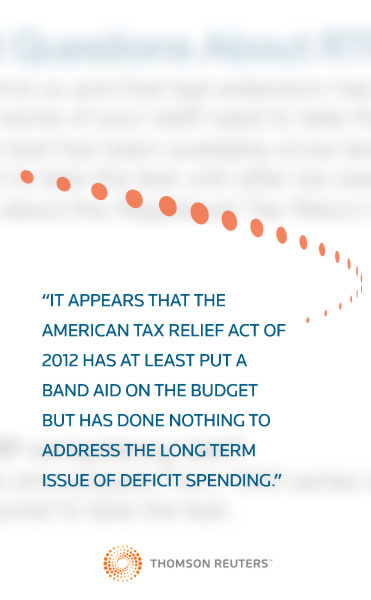 It appears that ATRA has at least put a Band Aid on the budget but has done nothing to address the long term issue of deficit spending. By trying to ignore the problem they have been successful in taking a set of complex rules and regulations (Internal Revenue Code) and made them almost incomprehensible. 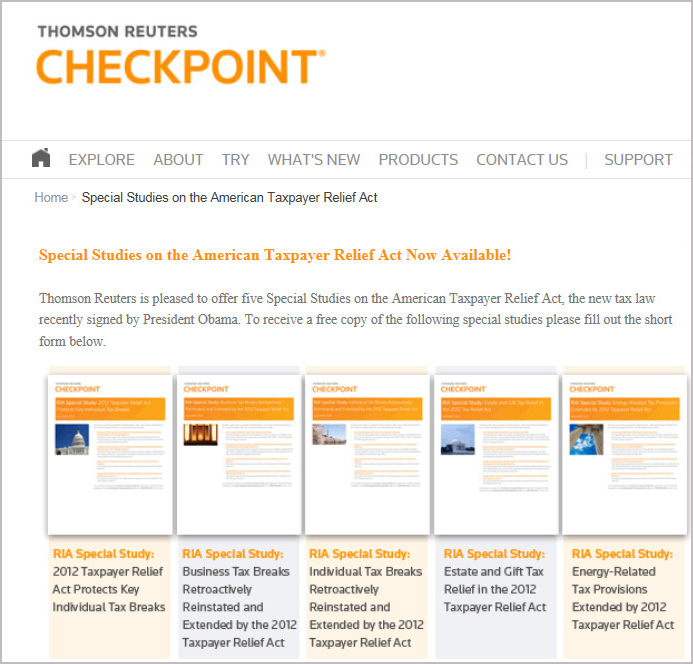 Thomson Reuters is pleased to offer five Special Studies on the American Taxpayer Relief Act, the new tax law recently signed by President Obama. To receive a free copy of the above special studies visit this download page.